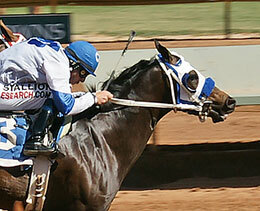 Grade 3 winner Kansas Morning won both the Ruidoso Juvenile Challenge and the Ruidoso Derby Challenge. ASH GROVE, MO—FEBRUARY 11, 2019—According to a story by Joe Hickan published last week on the KY3News website longtime Missouri horse breeder Burly Jenkins is offering a reward for the return of his graded stakes winner Kansas Morning. The son of world champion sire FDD Dynasty was recently stolen from Jenkins farm in Lawrence County, Missouri. He is out of the On A High mare On A Run. "Whoever did this had to come here in the night with a flashlight and a hauler, know what horse they wanted, go down in the field, find him and bring him out," Jenkins surmised. "They probably had a trailer down the road." With none of his other horses taken, Jenkins figures that the crooks knew what they were doing. In three seasons at the track Kansas Moring won or placed in five races and earned nearly $70,000. He won the Grade 3 Ruidoso Juvenile Challenge in 2013 and the Ruidoso Derby Challenge in 2014. He was also fourth in the Grade 3 Sunland Park Winter Derby. 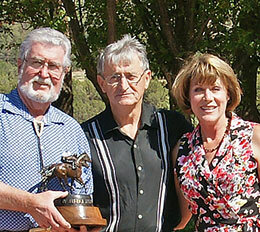 New Mexico Racing Commissioner Ray Willis presents the Ruidoso Adequan Derby Challenge stakes trophy to Mr. and Mrs. Burly Jenkins,owners of Kansas Morning. "They had to be aware of my circumstances," he said. "Someone who worked for me or someone who'd been in here. I am offering a $2,000 reward for his return." Not only did the thieves take his race horse, but they left behind an injured dog that Jenkins is now caring for. "Can you believe that? Dumping a dog too," he said. "They knew I was a dog person. It made me angry, that's for sure." Jenkins still has plenty of horses around his 64-acre farm, but the one that meant the most to him is gone. Of the 25 race-bred horses Jenkins owned, Kansas Morning was his favorite. "He earned more money than any horse I've ever had," Jenkins said. "He's a nice horse to be around too." Jenkins is hoping that someone reading this story can help him get Kanas Morning back home. "He deserves a lot of attention and a good life," Jenkins told KY3 News. He's worried that Kansas Morning has been sold to another owner for match racing. "They take 'em to Mexico and juice 'em up with illegal drugs and match-race 'em. I sure hope they haven't done that to him because he deserves much better." Person's having any information that could help Mr. Jenkins get Kansas Morning back, are asked to please call the Lawrence County Sheriff's Office at 417-466-2131.